I am a new-comer to NuForce products. 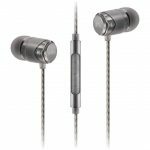 So I was very much intrigued by the offer to review their HEM4 IEMs. The NuForce HEM4 appear to be good value, looking at the spec sheet. They are kitted out with Knowles balanced armature drivers, encased in resonant free Lexan bodies. They certainly look the part. But, the proof is always in the listening. Let me start at the packaging. This really makes you feel that you’ve bought something a step above your usual earphones. Not unlike another certain IEM brand that I’ve reviewed here before, the NuForce HEM4 comes with a range of bits and pieces. In the tough, water resistant storage box you will find no less than 14 ear tips – two pairs of which are Comply editions. There is also a cleaning tool, a jack adapter and two cables – one aimed at home listening and the other for when you’re out an about. Those accessories are, in turn, stuffed inside a small zipped travel pouch. Handy for lint-free earpieces. The metallic blue finish to the earpieces looks good and the left and right sides are clearly marked. The colours of the letters correspond to the connecting ends of the cables. Lexan is the polycarbonate used for the bodies. Apparently this thermoplastic is characterised by outstanding mechanical, optical, electrical and thermal properties. According to NuForce it also cuts down on unwanted resonance. The twisted cable is primarily designed for home listening. It emits very little touch noise, which is good. The other one sports a mic, as well as a play/pause toggle. Handy for hands-free calling and those other things you might need when out and about. The latter one does emit some touch noise but does feel more up to the rigours of commuting than the twisted pair. Both sets lock in to the earpiece connectors tightly. They might be a tad fiddly for some but I found them reassuringly snug. I tried a couple of the eartips and, once sorted, isolation was brilliant. There’s no shortage of choice as there are 5 pairs of soft silicone ear tips, 2 pairs of Comply memory foam ear tips. I was really impressed by how comfortable the HEM4 were. Also, the fact that they didn’t try to escape should I need to jog for a bus (or last orders at the bar). The shape and fit really seemed to suit my ears. I tested the HEM4 through the NuForce uDAC-3 (reviewed soon), the Arcam rHead (review to come), as well as simply plugged in to my Nexus 6P and my loaned Honor 8 Pro. These are loaded with two Knowels drivers; a larger and smaller diaphragm for low and high frequencies, respectively. Upon my first listen I was struck by how warm the bass end was. 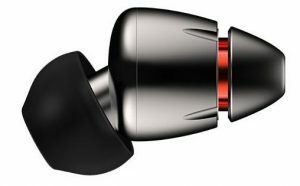 Most impressive was the soundstage that these earphones were able to create. These are definitely punching above their price bracket in that regard. With a quoted frequency range of 18 – 40,000Hz, I can only say that they do the job. The mids and treble are so clear and defined, one of the benefits of armature drivers, that I found myself selecting more acoustic numbers. Pianos and strings, especially. Upper mids and highs extend wide as well as show good depth. The high-end gives cymbals a realistic decay whilst giving high strings air and delicacy without siblance. Needless to say, Rodrigo y Gabriela’s tracks get some hammer for a while. The mids have great bite and attack which allows each note to cut through with scalpel precision. That is not to say that the HEM4 aren’t handy with more rocky stuff though. What I will say is that those looking for extreme bass, these are not for you. The low end is focused, tight and punchy. Not over-cooked. It is really articulate and fast. The atmospherics of the remastered ‘End of the Night’ by the Doors (Master quality on Tidal) are dreamlike. The HEM4s are able to pick out the slightest cymbal hit as well as the delicate keyboards. Morrison’s vocals come through smooth with instruments placed in wide dark spaces behind him. ‘Moon Rider’ from The Jesus and Mary Chain’s latest, Damage and Joy, is potent and powerful. Where some IEMs might find themselves getting confused by the distorted offerings from the brothers Reid, the HEM4 took it all in its stride. The HEM4 gives a clear and detailed presentation. I got a great sense of texture and tonality with an impressive soundstage. These IEMs produced the kind of accuracy I would expect from more expensive earphones. Classical and acoustic music was handled with warmth and definition, whilst the heavier end of my catalogue had bite and power. Some may find these lacking in the lows but everything was nicely balanced to these ears. You can buy the HEM4 direct from the Optoma shop for £249 now. They are currently £298 on Amazon.co.uk.